The HD-SB3512-20LCD& HD-5312-20LCD series SFPs are small form factor pluggable (SFP) transceivers compatible with multi-sourcing agreement (MSA). It is suitable for single-mode fiber (SMF) communications in 1.25Gbps Ethernet and 1G/2G Fiber Channel. One pair packed and sell together. Tx1310nm/ Rx 1550nm and Tx1550nm/ Rx1310nm. This transceivers are Class 1 Laser Products comply with FDA regulations. Meet Class 1 eye safety requirements of EN 60825 and the electrical safety requirements of EN 60950. 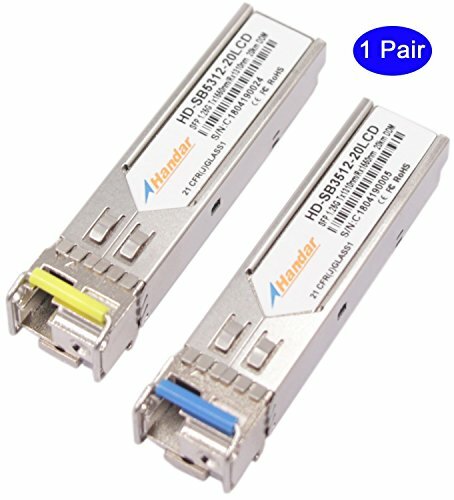 This 1.25G BIDI SFP transceiver if for Cisco routers and switches. One pair packed together Tx1310nm/ Rx 1550nm and Tx1550nm/ Rx1310nm. Simplex LC Connector; 20km reach. Handar has been more than 10 years in fiber optical manufacturing; all key components are made in our own factory with strict quality control. If you have any questions about this product by Handar, contact us by completing and submitting the form below. If you are looking for a specif part number, please include it with your message.